Monster works with watchmaker Hublot to create luxury noise-cancelling headphones | What Hi-Fi? Swiss luxury watchmaker Hublot, to create the Monster Hublot Inpsiration, a €1750 noise-cancelling design to be sold through Hublot stockists from this summer. Part of that technology is the use of two microphones for the noise cancelling, one handling constant sound (such as that of a plane's engines) while the other deals with intermittent sounds, such as clapping or the beeping of the watch of the person in Seat 1B. 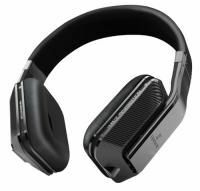 The drive units are built on solid metal frames, and the 'pillow-soft' earpads are cushioned with leather, while the housings are made from carbon-fibre.